Google Places Reviews Have Vanished! Google Places Reviews Missing – National Fault! 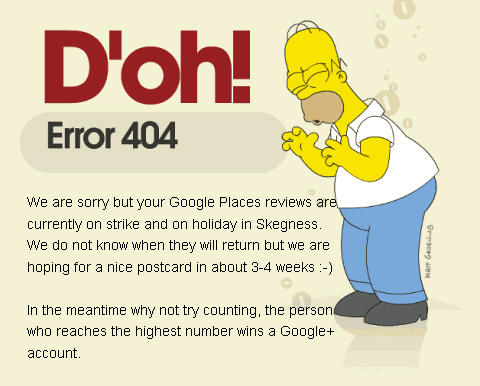 we are sorry but your google places reviews are currently on strike and on holiday in Skegness. We do not know when they will return but we are hoping for a nice postcard in about 3-4 weeks. Don’t worry guys this is a national fault with Google Places reviews disappearing from listings. The same thing happened 3 months ago and after 2 weeks of testing and trying to fix it we realised that it was a database error and everything would return to its previous state. Where have my Google Places reviews gone? They’ve just gone on a little holiday – they work hard all year to bring you new business and apart from the occasional sicky they’re there 365 days a year. Don’t Google reviews deserve a break too? Okay listen very carefully this is extremely important you follow this rule to the letter.